When it comes to giving gifts to those are I choose to or care about then that would be something I choose to do. Today I was reading an article on Yahoo about these two women who got married in Canada and threw a fit over a gift that was given to them. 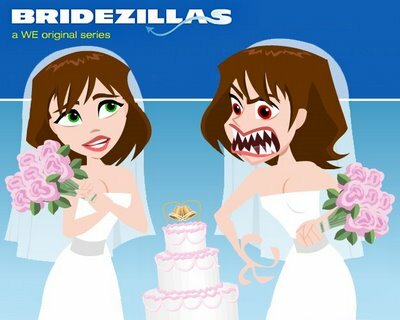 First off I want to give you the official meaning of a Bridezilla. Even though one word I bleeped out. Bridezilla One ridiculous spoiled b—- that thinks she is the center of the universe, just because her “show” (the wedding) is 18 months from now. In turn they got a nasty response and was ungrateful. They went on about how the brides spent $200.00 on the dinner for the guest and her boyfriend and so on. Because of the gift that the brides didn’t like they are no longer friends. If money was such a big deal to them, then they should have just run away and elope. They were obviously expecting much more than their friends could deliver on. I would have been happy with the gift and sent a thank you note. 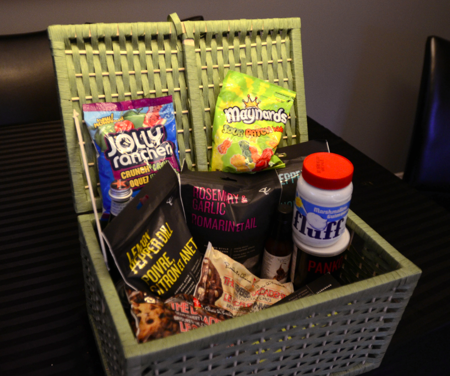 Who knows, one day those snacks would come in handy. This is what I feel is appropriate when I throw a party or reception. First of all those I invite are people I care about and I want them to be there to celebrate with me. No gifts are needed. I would much prefer them there than any gift. If a person is invited because they can give money or high end gifts, then they are at my party for the wrong reason. Now, If I’m going to a wedding, graduation or so on I will usually bring a gift. But that all depends on the person and what my financial situation is. If it is a young couple who doesn’t have much, I will always bring a gift and usually it is money, because I know they will need it. If I go to a graduation it is money too. They will need it for books and such if they are going to college. If they aren’t going to college, I give them a food gift card. For birthdays it will all depend. I have 5 grand-kids and it sure takes a lot of money to make sure they get what they want. If I go to a wedding and they have everything, I usually don’t bring a gift, but will get a card. A gift is just that, a gift. it isn’t or shouldn’t be an expectation when invited somewhere. If someone wants to invite me to a party or reception because I give good gifts, then they aren’t interested in me being there. They only want my pocketbook and that is not what I would consider a real invitation. That would be a fundraiser. When my husband and I got married, we lived in Texas and we went to the Justice of the Peace. We spent $11.00 on the wedding license and had to pay like $10.00 to the JP. I was in jeans and a t-shirt and so was Chuck. One of our friends met us at the court so she could witness our marriage. We did want to get married with family around, but because of medical issues we couldn’t do that. On that day Lona made us a cake and we went to Sonic for lunch. I still remember the cake and the day. It wasn’t about money at all. If that was so, Chuck would still be a happy bachelor as he says and I would be married to a tycoon, lol. In October it will be 33 years that we have been married and thankfully there was none of the antics that came from these bridges. Even though my mom did send us money. Which was nice, but it wasn’t why we got married. When it comes to gift giving, it should be personal and I do think that the couple that put this gift together was thinking of the brides. Too bad the brides weren’t thinking of the quests. I would suggest to them on their next wedding and I’m almost willing to bet that they will have a next one that they have a cover charge or run off and get married. Everyone will remember how horrible they were and wouldn’t want to be dragged through the mud.